Drug-induced diarrhea is loose, watery stools that occurs when you take certain medicines. Cryptosporidium is a protozoan parasite found in contaminated water. It has been increasingly recognized as the cause of outbreaks of diarrhea when water supplies become contaminated. In normal individuals, it is a self-limited disease. Among immunocompromised individuals with AIDS, cryptosporidium can cause severe diarrheal disease, gallbladder disease (cholecystitis), and inflammation of the pancreas (pancreatitis). The most common cause of diarrhea is a mild viral infection that resolves on its own with in a few days, usually known as the stomach flu. 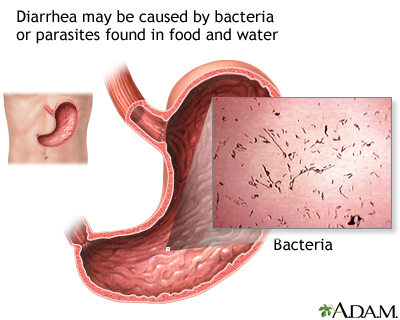 Two other common causes of diarrhea is from food poisoning and travelers diarrhea. They occur from eating food or drinking water contaminated with organisms like bacteria and parasites. Medications can also cause diarrhea, especially antibiotics, laxatives containing magnesium, and chemotherapy for cancer treatment.